Have an order for 100,000 pieces, but only need 10,000 a month? Krato Products stores raw stock and finished products made from aluminum, copper, stainless steel, brass and carbon steel, so long as it’s accompanied by a Purchase Order with releases. Inventory control of parts and materials is continuously monitored, giving the client reliable, timely information about deliveries and production schedules. 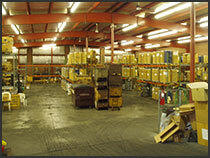 Call 314.436.2449 now to start storing with Krato Products. Or, contact us by completing the Request a Bid form to the left. Krato Products will make sure your needs are met on time with consistent accuracy.